Her only success, at the March 1996 federal election, pre-dated the formation of One Nation by a year. She recorded the largest swing against the Keating Labor government – 19.3 per cent – in the seat of Oxley, in south Brisbane. Each subsequent federal election she contested between 1998 and 2007 she lost. She also failed at the Queensland state election of 2009, and in New South Wales in 2003. For all those rejections, she still looms large in the state and national story because she turned politics on its head between 1996 and 2001. Ms Hanson’s maiden speech to parliament in September 1996 divided the nation into two shrill camps: those who thought she was speaking out on behalf of ordinary Australians and those who thought she was a racist. She formed One Nation six months later, in March 1997, and the opening round of Newspoll surveys showed she had attracted votes from all parties. The Liberal Party suffered the most, especially among men aged 50-plus who switched from the John Howard-led government to One Nation. The rise of One Nation triggered a three-way shadow war between Liberal, National and Labor. The Liberals feared losing seats to Labor through One Nation preferences; the Nationals feared losing seats directly to One Nation. 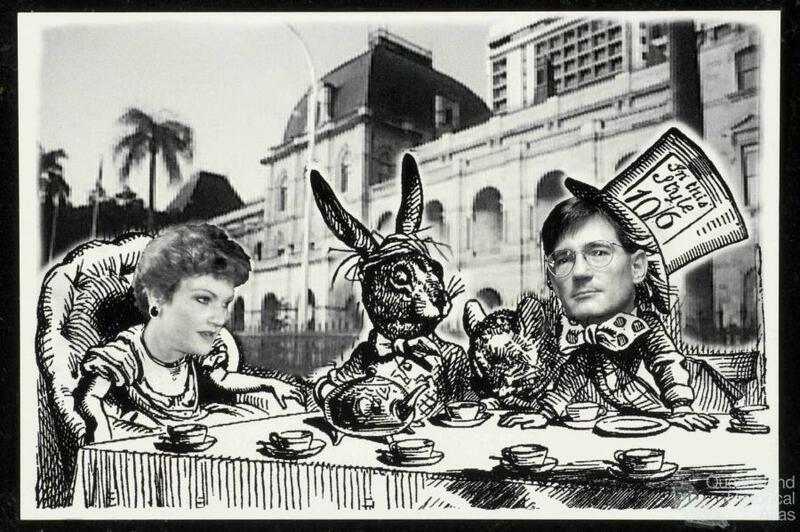 The competition between Coalition and Labor would help reshape the Queensland and the Federal political landscapes. At the State level, Queensland turned centre left, to Peter Beattie’s Labor. 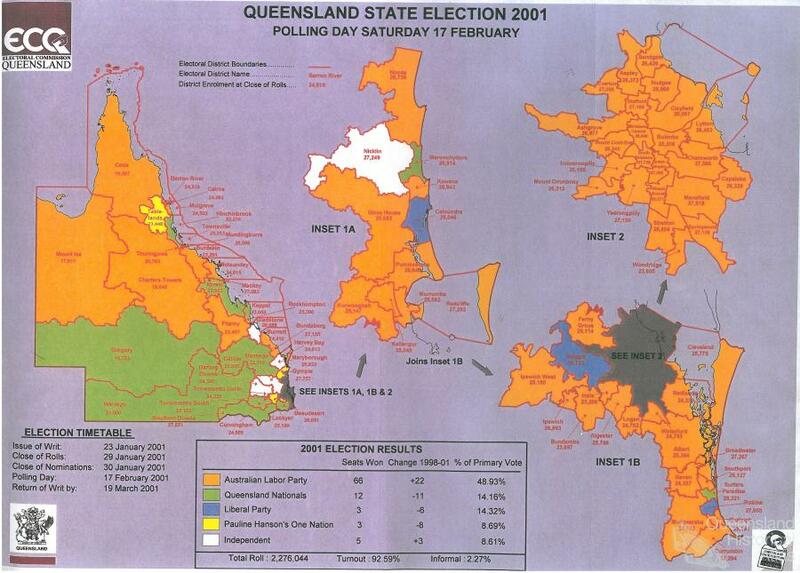 But at the Federal level, Queensland stuck with John Howard’s Coalition. Mr Beattie and Mr Howard differed in their tactical responses to One Nation. But each leader prevailed for the same basic reason: they beat Ms Hanson at their own game, politics. 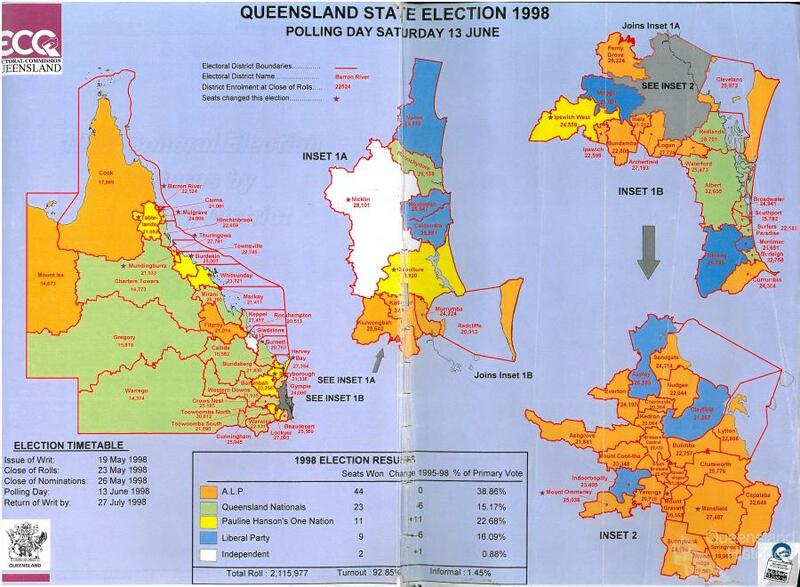 One Nation’s ballot box debut at the Queensland State election in June 1998 was stunning. Rob Borbidge’s Coalition government had a one seat majority in the 89-member parliament and had the most at stake. The National and Liberal parties advised their supporters to place One Nation ahead of Labor when allocating their preference votes. Labor, by contrast, placed One Nation last. The Labor strategy had the advantage of mixing principle with pragmatism. It was a pitch calculated to move city-based conservatives who didn’t like One Nation into the Labor column. The Coalition had the more complicated operation. It was trying to retrieve conservative votes that went to One Nation via the back door of preferences. The election result vindicated Labor, just. It held its number at 44 seats, while the Coalition lost 12 seats – 11 of which went to One Nation – to finish with 32. That left Labor one seat short of a majority, as it had been before the election. But Mr Beattie managed to form government with the support of one of the two independents. One Nation pulled in a primary vote of 22.7 per cent. Labor calculated that 7 per cent came off its own base and another 14 per cent from the Coalition. The message for the Howard government was there was no political benefit in courting One Nation preferences for the upcoming Federal election, which was held in September 1998. Mr Howard turned his campaign into a referendum on tax reform, denying Ms Hanson a platform on her favoured subjects of race and protectionism. Mr Howard had initially been agnostic toward Ms Hanson. He didn’t want to offend her followers by attacking her directly. The 1998 Federal election was a near-death experience for the Coalition. It lost the popular vote to Labor after preferences by 49 per cent to 51 per cent, but was able to contain the swing against it in many suburban and regional electorates in New South Wales and Queensland to leave it with a comfortable majority. One Nation collected 8.4 per cent of the primary votes for the House of Representatives in 1998, making it the third-most popular party after Labor and Liberal. Ms Hanson lost her bid for the new seat of Blair. Queensland was One Nation’s strongest state, where the vote was 14.4 per cent. A relieved Mr Howard thought One Nation had been beaten. But the party re-emerged as an existential threat in 2001. Again the State election in February was held before the Federal poll in November. Again the Coalition sought preferences from One Nation. Only this time the result was a landslide to Labor. Mr Beattie’s government was returned with 66 of the 89 seats. One Nation was reduced from 11 seats to 3 and its primary vote collapsed from 22.7 per cent to 8.7 per cent. The Nationals were left with 12 seats (down 9) and the Liberals with 3 seats (down 6), while the remaining 5 seats went to independents (up 3). Mr Howard took one look at the State result and decided he had to return One Nation primary votes to the Federal Coalition camp. The issue that helped deliver this ambition was border protection. At the 2001 Federal election, One Nation’s vote halved. It dropped by 4.3 per cent across Australia to just 4.1 per cent, and by 7.3 per cent in Queensland to 7.1 per cent. 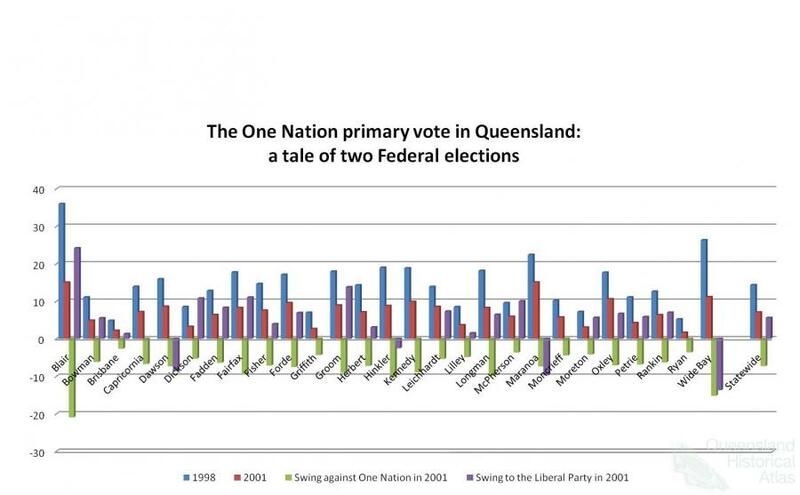 Tellingly, the Liberal primary vote increased by almost the same amount that it fell for One Nation: 3.2 per cent nationally and 5.6 per cent in Queensland.